Quitman Elementary Students set a goal of raising $3000 for the American Heart Association's "Kids Heart Challenge". The students met and then exceeded their goal by raising more than $5800. As a reward for their hard work and dedication the students were treated to a PE party with a bounce house and other fun activities. 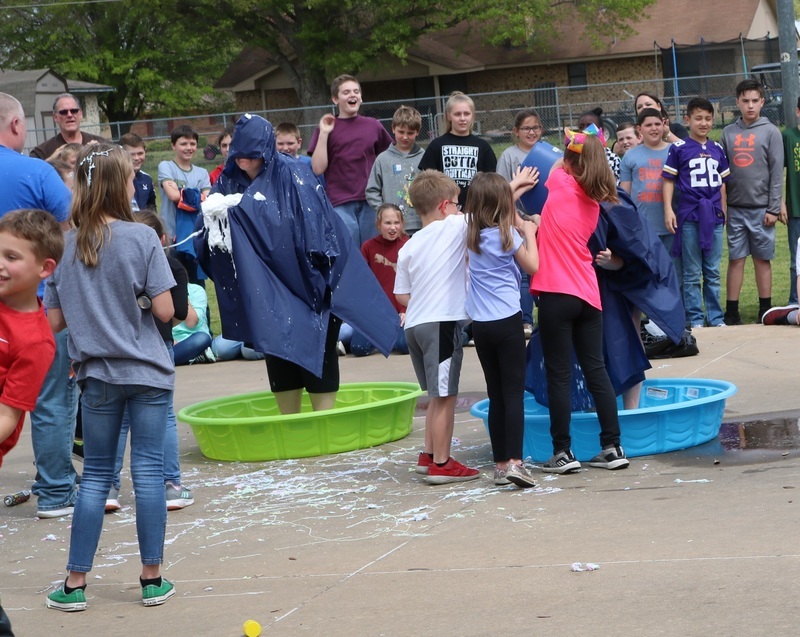 In addition, the students also "slimed" their coaches and "silly stringed" their Principals. Mrs. Bates' 1st grade class raised the most money by collecting over $560, with Mrs. Faulkners' and Mrs. Brinlee's Kindergarten classes not far behind collecting over $450 and $426, respectively. In addition to raising money for the AHA, the students also had the opportunity to fulfill daily challenges.112 QES students registered to participate in the daily challenges. Of the 112 that registered 42 completed the daily challenges of choosing water over soft drinks, 39 completed the daily challenge of doing a good deed, and 32 completed the daily challenge of exercising 60 minutes a day.